Phish has made a tradition of visiting Dicks Sporting Goods Park in Commerce City, just outside Denver, for three nights of music and friends. Phish Dicks, as the event is affectionately called, has become a staple in the Phish community, in comparison to the likes of the Gorge and MSG in NYC, and draws thousands of people from all corners of the county (& probably beyond). 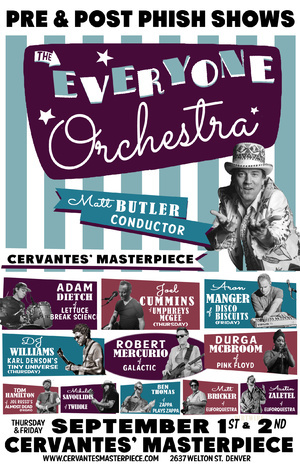 In keeping with tradition, Matt Butler is bringing The Everyone Orchestra back to Denver for two nights of stellar live improvisation with some incredible musicians. 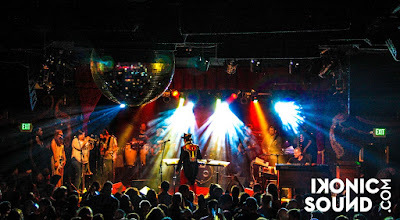 Butler has been leading a rotating cast of musicians through full-length shows that are entirely improvised since 2001. 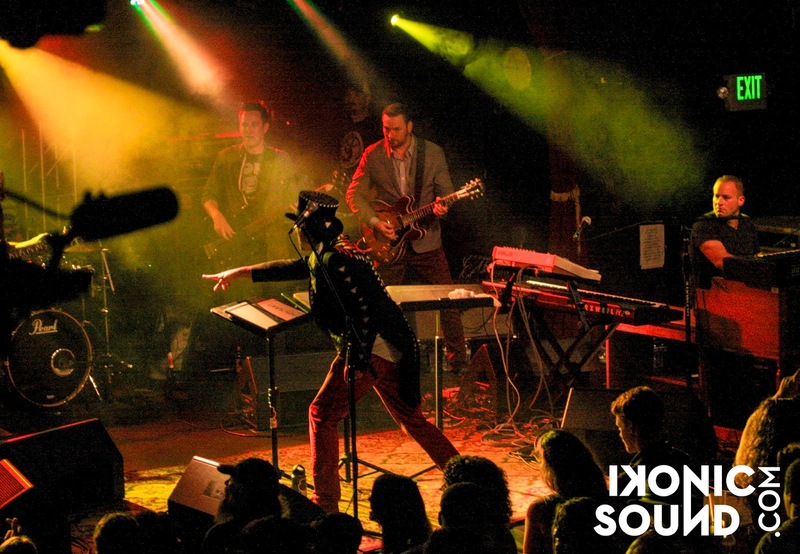 The Everyone Orchestra operates off the concept of using improvisation as a vehicle to explore instrumentation between musicians from different styles. According to their website: "The Everyone Orchestra conductor/founder Matt Butler has taken its participants, both on stage and off, on improvisational journeys with the most diverse of lineups at festivals, theaters and philanthropic events both nationally and internationally. A laundry list of hundreds of musicians, dancers, singers, guest conductors and community organizations have embraced the experience of EO in single shots of musical adrenaline to the soul. Tuning in to his energy, the band and audience utilize The Conductor as their pivot to the set mood of each passing jam as he communicates with the musicians using hand signs, whiteboard and assorted mime suggestions." 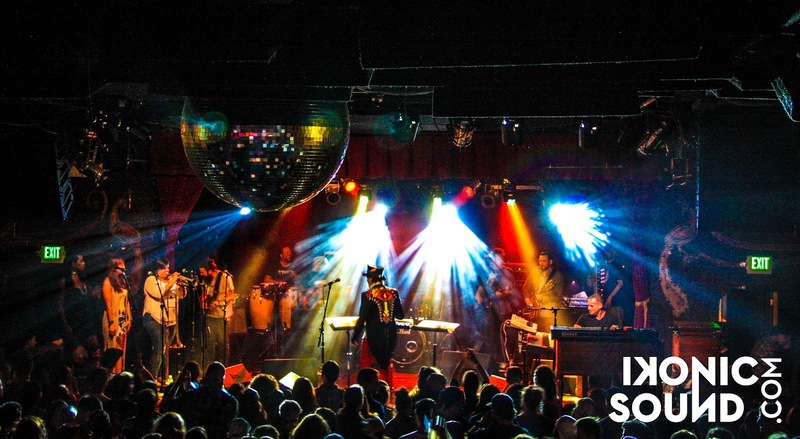 This year, the Everyone Orchestra is kicking off Phish Dicks weekend in style Thursday night, September 1st, at Cervantes' Ballrom's Other Side. The cast of musicians is pretty impressive for the first night, including Adam Deitch (Lettuce), Joel Cummins (Umphrey's McGee), Durga McBroom (Pink Floyd), DJ Williams (Karl Densons Tiny Universe), Robert Mercurio (Galactic), Mihali Savoulidis (Twiddle), Ben Thomas (Zappa Plays Zappa), and rounding things out, Matt Bricket and Austin Zalatel (Eufoquestra). You can still snag $20 early bird tickets to this show right now, HERE. Don't sleep on it as they're going up to $25 before the show and then another $5 to $30 for tickets the day of show. Doors are at 8pm and the show starts at 9pm. You can expect equally as stellar a show Friday for the Phish After-Show, featuring a similiar lineup. For the second night we gain Aron Magner (Disco Biscuits) and Tom Hamilton (Joe Russo's Almost Dead), but lose Joel Cummins and DJ Williams. The doors for Friday open up at 10:30pm and the show starts at 11:30pm. You can still get $20 advance tickets HERE, they go up to $25 day of show. If you're not already excited (which I don't know how you wouldn't be!! ), we'll be giving away some tickets through our Facebook page. So go like our page and keep an eye out for your chance to get in for free. Hope to see you all there! THE GIVEAWAY IS LIVE HERE!! CHECK IT OUT FOR YOUR CHANCE TO WIN A PAIR OF TICKETS TO ONE OF THE SHOWS! Dirtybird Brings Two Days Of Madness To Detroit, MI! 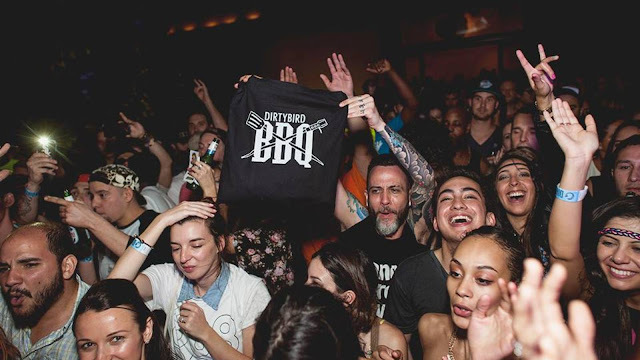 The Dirtybird crew comes together August 27th and 28th for a two day BBQ and you're invited! Featuring some of the best names in the industry, in one of the best places in the industry, this event is sure to be one of a kind. Provided with two days of Claude VonStroke, Justin Martin, J.Philip, Christian Martin vs Worthy, Golf Clap, Kill Frenzy & more, this midwest BBQ will go down with style. Put on your apron and let the games begin! Tickets available HERE!